Christianity began in a world that already had established religions, traditions, cultures and political and social structures. To review the early church history, it makes sense to review the major events that let directly to the establishment of the early Church. In Jerusalem, about 30 A.D. Jesus the Nazarene celebrated the Passover with His twelve disciples. During the passover meal, He revealed that Judas Iscariot would betray him. Later in the evening in the garden of Gethsemane, where Jesus went to pray with several of His disciples, a crowd of soldiers and Jewish leaders escorted by Judas Iscariot arrived to arrest Him. They brought Jesus to Pontius Pilate, who initially didn’t want to give Him up to the masses. But due to pressure and pleas from the mob and the priests, he gave in. Jesus was cruelly beaten, and a crown of thorns was pressed on his head and that night He was nailed to the cross at Golgotha alongside two thieves. Nine hours later He died and was entombed. To prevent His disciples from stealing His body, solider guarded the entrance to the cave where He was interred. Three days later Christ arose from the dead and lived to walk the earth once more. Forty days after His resurrection, He ascended into heaven, but not before promising His disciples that He would send them a Helper, the Holy Spirit. Ten days later, 120 of the believers were assembled in the “upper room”, where they were praying. Suddenly a sound of wind filled the room, and the Holy Spirit, like flames of fire, came down and rested on their heads. They were all filled with the Holy Spirit, and were able to speak in different languages. Out into the streets they went, preaching, and all the people, even those who spoke foreign languages, understood them. They were also able to heal the sick, blind and the lame. At this time the disciples and their followers started to live together in community. All their possessions were pooled, and they held all things in common as the Holy Spirit compelled them (Acts 2:42-46). The money from the items they sold was given to the disciples, who provided for all according to their needs. They lived communally, sharing all things in common. Initially Christians and the church were persecuted by Jewish religious leaders. 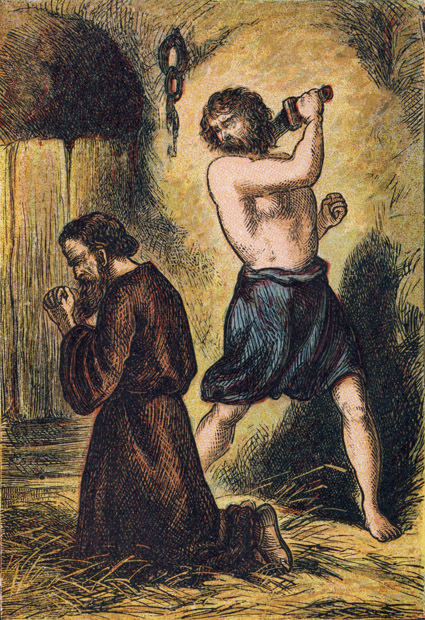 Among those arrested was Stephen, the first martyr, who was stoned to death. Observing the stoning was Paul, then known as Saul, the great Christian-hater and persecutor. On the way to Damascus where Paul was headed in search of Christians, a bright light from heaven fell upon him and he was struck blind. Jesus spoke with him and told him to go to Damascus and there wait for further instructions. A few days later after receiving instructions, Paul converted to Christianity and in the following years sailed to many parts of the Roman Empire to proclaim the Word of God. He made three missionary trips which sent him all around the known world. By this time, the Roman Empire had taken the lead role in the persecution of Christians and around 64 AD tradition says, the Apostle Paul was beheaded in Rome by Nero. The Empire continued to persecute Christians. The authorities did not accept some of the precepts of the Christians, including their worship of a new God. As a result, persecution against Christians grew and they were arrested throughout the Roman Empire. Further, Christians were pacifistic and refused to fight and kill others, even in war. Many were martyred in the huge amphitheaters for the spectacle of the masses.